Our partner school in Exeter, The Globe English Centre, offers junior (7-10 years) and youth (11-14 / 15-17 years) programs all year round. 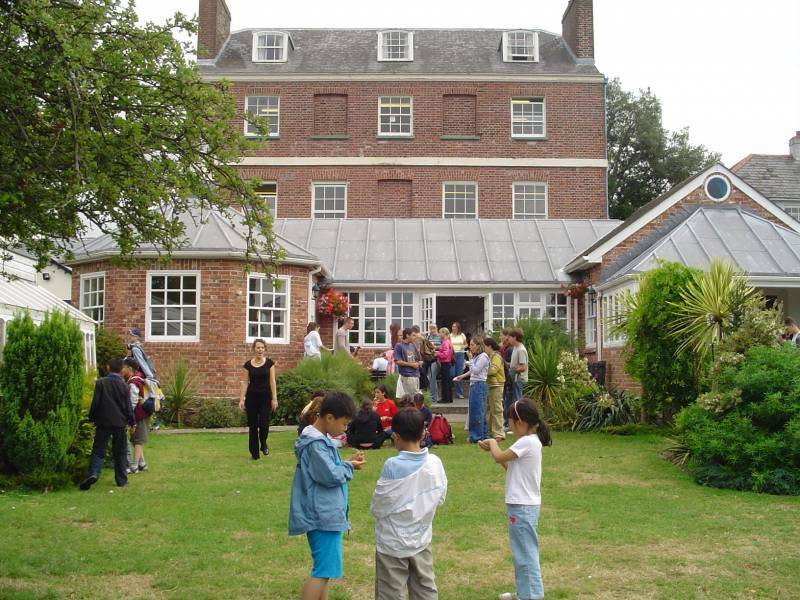 Located in a beautifully modernised 19th century building, The Globe offers excellent facilities to learn English and is surrounded by trees and gardens with lovely views over the Exe valley. Activities that take place in the school or on campus: Cooking sessions, quizzes, board games, billiards, table tennis competitions, and barbecues, among others. Activities take place in and around Exeter: cinema afternoons, concerts, excursions to local landmarks, archery, canoeing, theme park visits, or literary trails (Agatha Christie, Charles Dickens). Sports: football, badminton, kayaking, rock-climbing and others. Visits to famous places and landmarks in the beautiful region of Devon and beyond: Stonehenge, Lands’ End, Exeter Cathedral, Roman Baths and more. City visits: Bath, Bristol, Plymouth, Cardiff and London in the summer, as well as educational visits to exciting and unusual places including Eden Project, Royal Albert Memorial Museum, Plymouth Aquarium and more. Lessons: 20 lessons per week, from Monday to Friday 9:30h - 13:00h (timetable subject to changes). Accommodation: host families, in single or shared rooms, with students of different nationalities. Curfew: Depending on the time of the year and the age of the student. For more information, see Host Family. Supervision: 24 hours/ 7 days a week. The host families work in close co-operation with the school in supervising the younger students and ensure that school rules and parents' wishes are respected. Airport transfer: included. Exeter airport transfer is provided on arrival and departure. Classes focus on the use of natural English and may include authentic materials, role play, music, drama and project work and it is designed for students aged 11-14 and 15-17 years. This stimulating course combines language learning with an enjoyable holiday. The dynamic teaching programme encourages oral communication, activates passive knowledge and develops confidence. The varied social programme gives opportunities to practise English while discovering and enjoying the British culture and way of life. A teacher always accompanies the students on activities. Studying English also means learning about England, discovering the country and meeting the people. Our Social Programme will give you these opportunities and more. It also gives you the chance to get to know the teachers and the other students better, make new friends and practise your English. The junior course (11-19 years) also includes an activity programme on 5 afternoons and 2 evenings per week and an excursion on Saturdays. The school will be running a normal programme on bank holidays. Arrival and departure is on Sundays. A return airport transfer from Exeter airport is included in the price for those staying with a host family. Accommodation: host families, in shared rooms, with a student of different nationality. Curfew: students are fully supervised and they are not allowed to go out under any circumstances. Supervision: 24 hours/ 7 days a week. The host families work in close co-operation with the school in supervising the younger students and ensure that school rules and parents' wishes are respected. Daily transfers school/accommodation/activities are included. Note: To participate in the junior course (7-10 years), the child must ALWAYS be accompanied by a parent or sibling. The junior course is aimed at primary school children (7-10 years old) and takes place all year-round. Lessons and social programmes are adapted to suit younger children. Teachers run very lively and stimulating classes with project work and many hands on activities and games. Studying English also means learning about England, discovering the country and meeting the people. Our Social Programme will give you these opportunities and more. It also gives you a chance to get to know the teachers and the other students better, make new friends and practise your English. The course includes 20 lessons per week in the morning and the social programme in the afternoon. The programme also includes a daily transfer between the school/accommodation/activities. The junior course (7-10 years) also includes an activity programme on 5 afternoons and 2 evenings per week and an excursion on Saturdays. For the participants of the junior course (7-10 years) transfers from their host family to the school (and back) are included. Participants of the junior course (7-10 years) must ALWAYS be accompanied by a parent or sibling during their stay. This is an opportunity for our students to live with a local British family, enjoy the local traditions and cuisine and, most importantly, an excellent chance to practice English in a family setting. It is a fantastic way to meet new people and learn about the local way of life. Families never have 2 students of the same mother tongue unless the students ask to share with a friend. Host families are carefully selected by the Globe Accommodation Officer and are within 25-30 minutes’ walk from the school. A free bus pass is given on the rare occasion families are located outside of this distance. Daily transfers between the school/accommodation/activities are provided for the Explorers (7-10 years). Families are carefully selected and are located near the school. They provide a comfortable, heated bedroom and offer breakfast, packed lunch and evening meal. They will do some light laundry on a weekly basis, if required. The times on which students should be back in their host family each day depend on the time of the year and the age of the student.